This article highlights the relationship between the various data types in Safefood 360° which include Programs, Plans, Records, and Entities. These are integral components of your Food Safety Management System and it is important that you understand them. You will find programs in most modules in the application. Examples include Calibration Programs, Cleaning Programs, Pest Inspection Programs, Internal Auditing Programs and many more. Once you have created and saved a program it can be found on the plan tab for that that specific module. The purpose of Plan tabs are to provide users and their auditors with key information which indicate that the requirements of the system are planned and up to date. The plan presents all of your programs in one location and importantly shows when the program was last conducted, and when it is next due. You will also find a copy of your plan in the reports tab. When you save a program the repeat frequency you specify will create the required record and at the required time. This happens automatically and without any user intervention. These records are essentially offspring of the program and inherit all of the attributes you defined when setting up your program. You can also create records outside of the program frequency by clicking the appropriate action button in each module. Entities refer to the static underlying objects in the application which include, Employees, Customers, Suppliers, Items of Equipment, Products, Materials and all the other entities you will find under the Master Data center. In the cleaning module you can add a Cleaning Program. 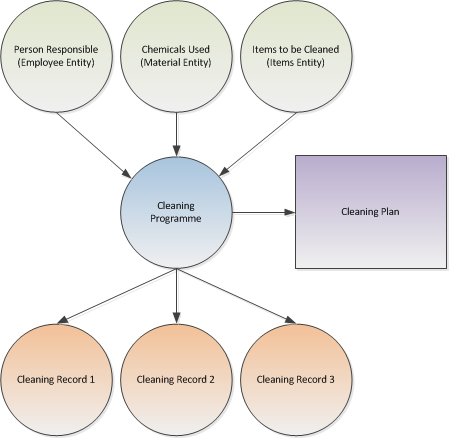 In doing so you will be asked to select the Person Responsible for cleaning (Entity), the items to be cleaned (Entity) as well as any chemicals (Entity) used during the cleaning. When you save your program you will find it in your Cleaning Plan which will monitor the next due date that the program must be conducted before. As the program becomes due it will automatically generate your Cleaning Record for completion which you will find in the Actions Tab.